The online platform for team-based care. ACT.md was born out of the personal challenges our founders faced trying to coordinate care for loved ones with complex needs. They envisioned a patient-centered tool that crossed barriers of practice settings where the patient, their caregivers and healthcare providers could communicate, collaborate, and coordinate care as a team. Social networking sites have created new paradigms for communication and content sharing where individuals can visualize and engage with their community. This inspired us to develop a virtual medical neighborhood, where patients can authorize and "friend" the individuals involved in their care—not only doctors and nurses, but case managers, community service providers, family and other caregivers who are of critical importance, but often left out of the conversation. ACT.md aims to improve patient outcomes, patient and provider satisfaction and communication, and decrease the total cost of care. We achieve this by enabling care teams—including patients and their caregivers—to work together in an environment that (1) allows care teams to connect, and meet patients where they’re at (2) facilitates the sharing of a single plan of care, and (3) highlights outcomes important to the patient. ACT.md helps teams realize true “team-based health care,” which has been recognized by the Institute of Medicine, American Medical Association, and others as a key strategy for improving the American healthcare system (1-5). 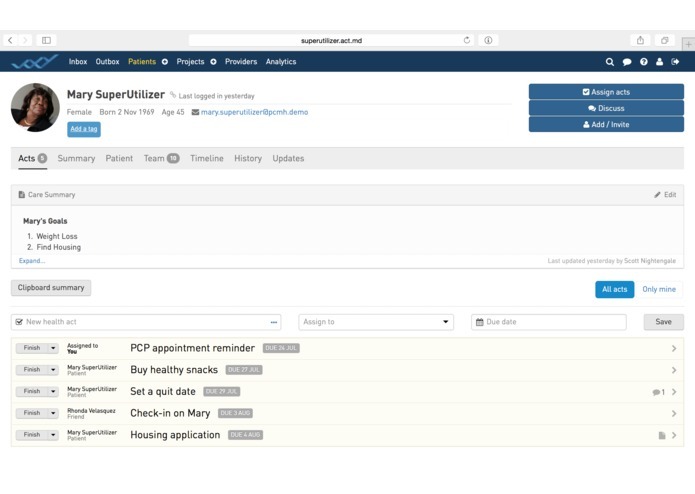 For the super utilizer, ACT.md provides a solution to (1) coordinate care with complex patients and multidisciplinary care-teams; (2) share the patient’s single plan of care, including patient-defined goals; and (3) improve the patient’s experience, as an involved and valuable member of their own care team. ACT.md is a secure, HIPAA-compliant platform—accessible via any modern browser on a desktop, laptop, tablet, or smartphone. It is cloud-based, and requires no installation. It can also integrate with EMR's through ADT. Our users include: health care professionals (nurses, doctors, care coordinators), service providers in the community (social workers, home health care providers, case managers), patients, and their trusted caregivers. The ACT.md platform is device independent—patients can access us on their smartphone, care providers can access us on their PC or tablet. On mobile, ACT.md uses a minimal amount of data. Along with our platform, we also offer non-clinical services through our team of Health Prompters. ACT.md Health Prompters help care teams engage with their patients, and they help patients manage their care in the real world. In ACT.md, providers and patients develop a care plan is truly "living." It can be used as a point of reference for the entire care team, including the patient, from anywhere at any time. Mitchell P, Wynia M, Golden R, et al. Core principles & values of effective team-based health care. Institute of Medicine. 2012.  http://www.ahrq.gov/professionals/prevention-chronic-care/improve/coordination/  http://www.ama-assn.org/ama/pub/advocacy/state-advocacy-arc/state-advocacy-campaigns/physician-team-based-care.page  http://www.ucsf.edu/news/2014/08/116856/team-based-approach-primary-care  Goldberg DG, Beeson T, Kuzel AJ et al. Population Health Management. 2013; 16(3):150-6.